Description: In this game, we tried to put together our favorite features in the TDs we love (Cursed Treasure, Kingdom Rush, Gemcraft…) as well as some ideas of our own. We hope you’ll enjoy it ! The people of Fairyland are after you. 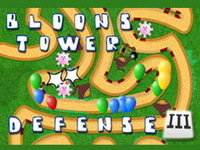 Fight your way back to the dark forest in this epic tower defense ! Raise an army of skeletons, command powerful beasts, summon zombies, manipulate your enemies, unlock 30 skills, 56 achievements, upgrade your towers with special abilities and defeat your pursuers ! Instructions: The enemies will try to take the kids from your camp and take them away. Don’t let this happen ! Build and upgrade towers to attack them. Each tower must be built near a supporting tower of the same type. For example, you can only place haunted cabins near cemeteries. - Find the game too easy ? Customize the difficulty settings !